This species is accepted, and its native range is NE. & S. India to Indo-China, Sri Lanka. N.E. India (Meghalaya: Khasia, type), N. Myanmar, Thailand. Medium-sized, clumping, evergreen herb to 1.5 m with watery latex. Stem erect to later decumbent, the zone just behind the active portion with sparse fibrous cataphyllary remains. Leaves several together, clustered at the tips of stems of larger plants; petiole to 1.5 m long, dull purple; petiolar sheath somewhat membranous; leaf blade peltate, cordate-sagittate or cordate-ovate, to 100 × 80 cm, apex short acuminate, base margins undulate; primary lateral veins 9–12 on each side; interprimary veins forming well-defined interprimary collecting veins, the blade adaxially somewhat quilted between the primary vein and interprimary veins. Inflorescences 2 together, subtended by membranous cataphylls at anthesis; peduncle stout, ca 45 cm long, much exceeding the cataphylls at anthesis, medium dull purple; spathe 10–12 cm long, constricted about 1/6 of the way from the base; lower part ovoid, grey-green slightly glaucous; spathe limb broadly oblong-lanceolate, 10–30 × 4–8 cm, hooded at anthesis, later reflexed, then deliquescent, membranous, exterior grey-green, interior greenish white; spadix shorter than the spathe, shortly stipitate; pistillate flower zone 1–2 × ca 1.5 cm; ovaries brownish green, ca 3 mm diam., ascending; stigma sessile, weakly 3-lobed, the lobes blunt, tan; sterile interstice narrowing abruptly above the pistillate zone, then equalling the staminate zone, ivory, very slightly narrowed corresponding to the spathe constriction; synandrodia composed of rhombo-hexagonal stamens, ca 2.5 mm diam., the lowermost ones enlarged and very irregular; staminate flower zone cylindrical, ca 3–5 × ca 1.5 cm diam., whitish; synandria rhombo-hexagonal, convex-topped owing to cap-forming synconnective, ca 1.5 mm diam. 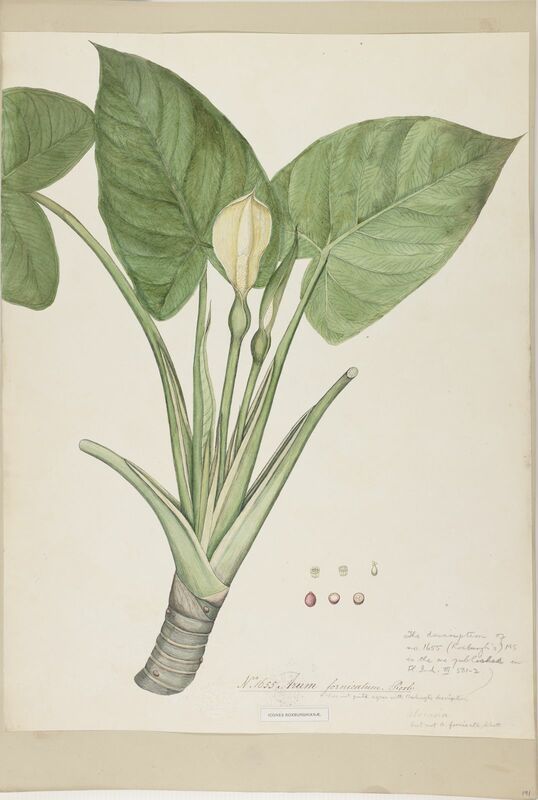 ; appendix elongate-conical, 3–5.5 × 1–2 cm, equalling length of the spadix, only very slightly thicker than the staminate zone at the base, then gradually tapering, white. 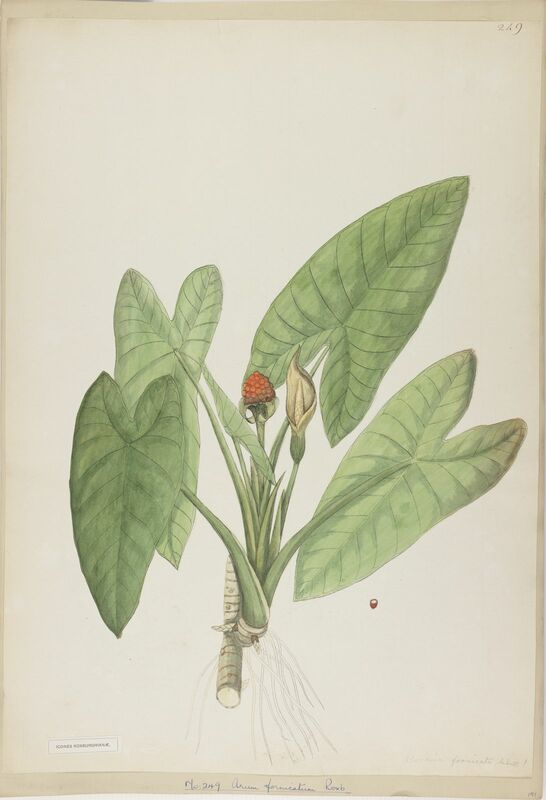 Fruiting spathe 6–8 cm long, green; fruits globose, ca 5 mm diam., ripening scarlet. Primary and secondary humid evergreen to semideciduous forests, riverbanks, below 1000 m asl. Boyce, P.C., Sookchaloem, D., Hetterscheid, W.L.A., Gusman, G., Jacobsen, N., Idei, T. & Nguyen, V.D. (2012). Flora of Thailand 11(2): 101-325. The Forest Herbarium, National Park, Wildlife and Plant Conservation Department, Bangkok. Choudhary, R.K., Srivastava, R.C., Das, A.K. & Lee, J. (2012). Floristic diversity assessment and vegetation analysis of Upper Siang district of eastern Himalaya in North East India Korean Journal of Plant Taxonomy 42: 222-246. Ara, H. (2001). 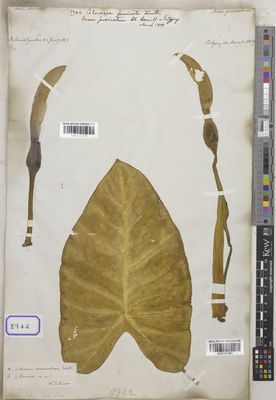 An Annotated Checklist of Aroids of Bangladesh Bangladesh Journal of Plant Taxonomy 8(2): 19-34.